On the Company tab, click Commission Types; on the Commission Types page, click the Profiles link next to the appropriate commission type; on the Profiles page, click the Rules link next to the appropriate commission profile. On the Rules page, click Add on the toolbar. 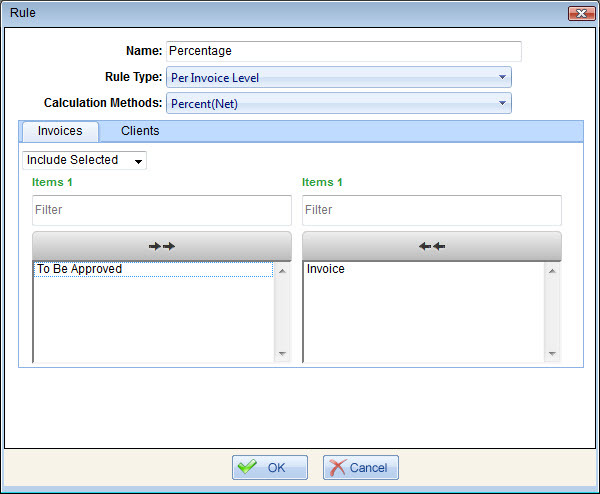 Rule Type allows selecting the level of invoice amount from which commissions are calculated: Per Invoice Level (from the amount of the whole invoice), Per Work Order Level (from the amount of each work order included to invoice), Per Service Level (from the amount of each service included to each work order included to invoice). Calculation Methods define how commissions are calculated: Percent(Gross) (percentage from the amount with surcharges, if any), Percent(Net) (percentage from the amount with surcharges and discounts, if any), Money(Flat) (fixed amount of money for each employee assigned to work order services), Money(Split Evenly) (fixed amount of money which is divided equally among technicians assigned to work order services), Money(Percentage) (fixed amount of money which is divided proportionally among technicians assigned to work order services), or Hourly Rate (technician hourly rate multiplied by service labor time). Clients, Invoices, Work Orders, and Services tabs allow selecting particular clients, invoice types, work order types, or services, to which this commission rule is applied or not applied: Include All, Include Selected, or Exclude Selected.